NEW FOR 2019! Begin your adventure in Hanoi, where centuries-old architecture is a wonderful nod to the past and the Old Quarter strikes a fine contrast with its many temples. 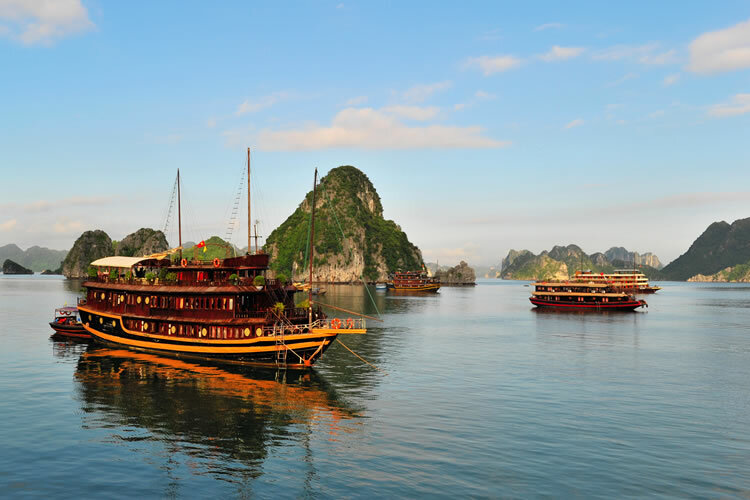 Cruise the emerald waters of Halong Bay in a traditional junk boat, learn of Ho Chi Minh City’s fascinating war history and embark on a once-ina-lifetime river cruise along the Mekong. Enjoy Tuk-Tuk and ox cart tours in Phnom Penh and finish your adventure in the Cambodian city of Siem Reap, where you’ll witness Angkor Wat and attend a circus performance. Xin Chao and welcome to Hanoi! On arrival, you will be met by your Emerald Waterways representative and transferred to your hotel situated in downtown Hanoi. Relax at the hotel, explore the city or wander Hanoi’s romantic West Lake. This evening, meet your Tour Director for your welcome briefing. Today you will enjoy a full-day city tour of Hanoi. Including the Ho Chi Minh mausoleum, the final resting place of the revolutionary leader, the small but iconic One Pillar pagoda and the Temple of Literature. The Temple of Literature was Vietnam’s first university and it was established to educate Vietnam’s royalty, mandarins and members of the elite. The university functioned for an incredible 700 years and its gardens and well-preserved architecture offer a fascinating glimpse into Vietnam’s past. EmeraldPLUS: As part of your EmeraldPLUS programme, you will enjoy lunch at KOTO, a unique restaurant set up to train and educate disadvantaged street children. After lunch, continue with a visit to Hanoi’s Old Quarter also known as the ‘36 streets’. Take a walking tour through charming Hang Be Market and around Hoan Kiem Lake, as well as stopping at Ngoc Son Temple. This bustling area of narrow streets and alleys is home to literally thousands of small businesses and shopkeepers. It is a great place to explore with plenty of photo opportunities. Later, attend a traditional performance from the famous water puppets, dating back to the 11th century, this is a unique Vietnamese art form depicting scenes from rural life and episodes of historical significance. This morning after breakfast, leave Hanoi and travel to Halong Bay where you will board your luxurious traditional style junk boat. Cruise through the bays and islets enjoying the stunning scenery of this magnificent region. Enjoy the tours offered on-board, learn more about the main livelihood of the locals in the area or relax on-board. Towards the end of the day the boat sets anchor for the night among the karst formations. Dinner is served on-board. Today, you will be transferred for your boat tour to cruise to the bay’s most untouched areas. Enjoy swimming on quiet beaches, visiting water tunnels, fishing villages or kayaking. Lunch is served on-board the boat by your private chef. Return in the evening, after a full day of exploration, to your traditional junk boat. Enjoy the morning in the middle of the bay while having breakfast and cruising through the magnificent rock formations and back towards port. Bid farewell to the boat on Halong Bay and transfer to Hanoi airport, with a stop en-route for a light lunch at a local restaurant. At the airport in Hanoi, board your flight to Ho Chi Minh City for your included two-night stay. In the afternoon, you will have an orientation tour of Ho Chi Minh City, starting with a visit to the city’s most iconic building, Reunification Palace. Formerly called the Presidential Palace, images of the building were seen around the world on 30th April 1975 when tanks stormed the gates as Saigon fell to the North Vietnamese. Then, stroll through Ho Chi Minh City’s Colonial quarter, experiencing every-day life. Admire the beautiful architecture of the Opera House, City Hall and the old Saigon Post Office, listen to the stories about the glory days of French Indochina and how that era continues to influence aspects of modern Vietnamese culture. Drive away from Ho Chi Minh City, watching the city skyline fade into the distance as the road winds through rice paddies, villages and other scenes typical to southern Vietnam. We spend a couple of hours walking around Cu Chi’s rugged grounds with a local guide. Hear how the residents constructed an intricate, underground network of tunnels during the French and American Wars. Hear incredible tales about the unusual foods the residents ate to survive and much more. Once above ground, see other ingenious items used by the residents to defend themselves such as bamboo traps and camouflaged pits. Upon your return to Ho Chi Minh City, you’re free to spend the afternoon as you please. Today, transfer from your hotel and embark on your Emerald Waterways Star-Ship and be welcomed by your captain and crew. 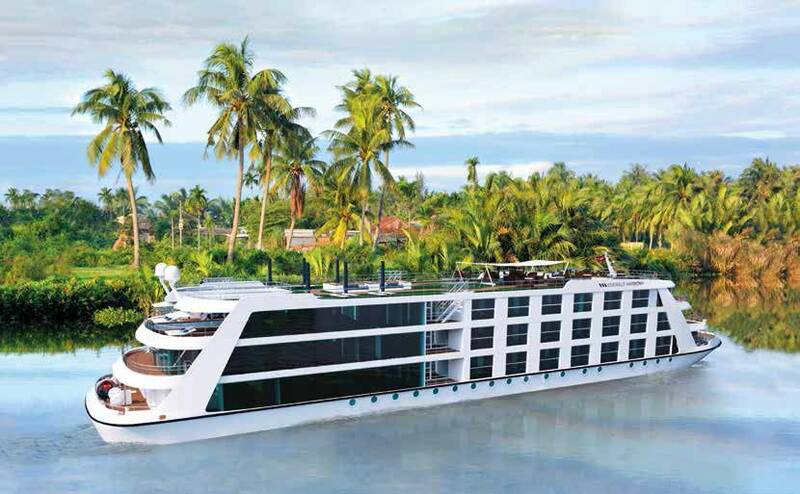 Set sail to My Tho in the Mekong Delta and, this evening, enjoy your first dinner on-board with your fellow travellers. Your Cruise Director will also conduct a port talk to review the activities and itinerary for the days ahead. This morning you will be taken to the village of Đat Dua, where you will watch a coconut candy and other fruits workshop. Then travel to the Tan Long Pagoda and return to your Star-Ship to sail onwards to Sa Dec.
Start your day with a visit to the Chinese congregational house in Kien An Cung. Afterwards, visit the home of Mr. Huynh Thuy Le who inspired Marguerite Duras’ novel, L’Amant, then take a walk through the Central Market in town. Return to the star-ship and sail to My An Hung village. In the afternoon, as part of your EmeraldPLUS program, you will have a chance to visit this lovely and unspoiled place. This morning is yours to explore on your own or, if you prefer, you can take part in the DiscoverMORE optional excursion to the Ramsar Bird Sanctuary. In the afternoon, embark on a visit to the Long Khanh Island. There, you will visit a local family and learn about scarf weaving. Then, visit the Hoa Hao Buddhist pagoda and a grapefruit garden. Return to the star-ship and this evening be delighted by a Lion Dance performance on board. As part of your EmeraldPLUS program, visit a unique family-owned Lanh My A silk producing factory. The silk product is created with dyes made from the mac nua fruit, a kind of wood tree, which originally came from the Tan Chau silk village about 100 years ago. Here, you will learn more about the long, complicated silk-making process and have a chance to touch the real Lanh My A silk. Continue with a visit to the Evergreen Island for a walk through a local village, before re-boarding your luxury Star-Ship and cruise to the border between Vietnam and Cambodia. Wake up in Cambodia’s capital, Phnom Penh. The city was once known as the “Pearl of Asia”, but it was almost entirely evacuated by the Khmer Rouge in 1975. This morning, we learn more about the Khmer Rouge and the darkest days of Cambodian history. A short drive will take you to the Killing Fields at Choeung Ek where you can walk through the fields. This afternoon, you will visit the majestic Royal Palace with its gardens and Central Market. This evening, take an EmeraldPLUS tuk-tuk ride through Phnom Penh ending on a rooftop terrace with great views of the city. Start your day with an EmeraldPLUS ox cart ride to Wat Kampong Tralach to visit the Oudong Temples. Located North of Phnom Penh, Oudong was the former royal capital of Cambodia until it moved to Phnom Penh in the 1800s. Important remnants on the temple sight include the burial sites of Khmer kings as well as religious artefacts dating back more than a hundred years. In one of the Oudong Temples there was a known large Buddha statue which was damaged during skirmishes with the Khmer Rouge who had the hill as one of their last strongholds. Receive a traditional Buddhist blessing from the temple’s resident Monks as part of your EmeraldPLUS program. Bid Farewell to your luxury Star-Ship in the morning and continue by road to Siem Reap for your included three-night stay. Known as the gateway to the magnificent Temples of Angkor, Siem Reap is a vibrant city with a lot to offer. This evening, witness the incredible Phare Cambodian Circus, a spectacle of acrobatics, theatre and music. Phare is an NGO founded by Cambodian refugees to assist disadvantaged young people by teaching them performing arts. Today, start with a visit to Angkor Thom, the last capital of the Khmer Empire. It was a fortified city, home to priests, officials of the palace and military, as well as buildings for administering the kingdom. Consisting of a square, each side of which is about two miles long and a laterite wall, about eight metres in height, spanning an area of 360 acres. After the tour, visit the sacred Temple of Ta Prohm, which is overgrown by jungle trees. Rise early and embark on a fascinating journey to Angkor Wat. This UNESCO World Heritage-listed site is known for its elaborate decorations and intricate carvings throughout. Enjoy the sunrise and take the opportunity to capture quintessential pictures of Angkor Wat. Return to your hotel and enjoy the day at leisure. This evening, enjoy a farewell evening dinner together, accompanied by Chayyom dancers. Return flights from London Heathrow or Manchester. Deluxe hotels with all service charges, taxes and porterage included. 41 meals: 16 breakfasts, 13 lunches and 12 dinners. Complimentary wine, beer and soft drinks to accompany lunch and dinner while on-board Emerald Harmony. Complimentary water provided on-board and during excursions. First-class service from an English-speaking crew and knowledgeable local guides. Terms and conditions apply, all offers are subject to availability and operator booking conditions. ^Itinerary operates in reverse. All fares shown are a guide and are subject to change. Fares are per person based on 2 people sharing the lead in grade stateroom unless otherwise stated. *All savings have been included in fares displayed and are valid on new bookings only. Offer may be withdrawn at any time. We charge a one-off small £20 booking fee. That’s it - nothing more and no add ons when you pay the balance. E&OE. ABTA P6710.